ATHOLIC CHURCHES ought to be beautiful, and this actually is an affirmation of Catholic theology. As time goes on, I will have occasion to speak of the need for beauty in our churches and liturgies (as well as the the theological reasons for this), and I hope readers will enjoy my reflections about this subject. 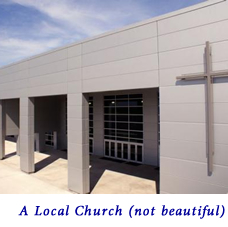 My wife and I recently drove by a Protestant church which was emphatically not beautiful (see the picture to the right). I chose to “pick on” a Protestant church, but I am sad to admit that I could easily have taken pictures of many Catholic churches in our town that are ugly and unbalanced beyond belief. However, once upon a time Catholic churches used to be artistically pleasing and sacred in both design and function. In a short blog like this, I cannot explain all the complexities behind the world’s great artistic works (sorry to let you down!). Needless to say, that would take volumes. However, I will give a small “sample” of what I am trying to describe. I will use examples from my own works, but please do not infer that I am claiming to be as great a composer as Morales, or Victoria, or Bach, or any of the truly great composers—I am not! In compositional class, one learns that stepwise bass motion (descending or ascending) often leads to great harmonizations. The entire first half of my harmonization for Of the Father’s Love Begotten [pdf] is stepwise descending bass motion. Another example would be the bass line at the words “You alone are the Most High” in this “Glory To God” [pdf]. Sounds pretty easy, no? Just create stepwise motion in the bass and fill in the other voices, right? Wrong! The thing is, a million other factors have an impact on the composer’s ability to create stepwise motion in the bass line (or any other line). The motion of all voices must be varied throughout (parallel motion, similar motion, oblique motion, and contrary motion). A variety of chords must be used: not the same few chords over and over. Chords must be used in the correct position (e.g. no 6/4 chords). The chord doublings must be correct (Roots and Fifths, usually). The voice leading must be smooth, in general, except when certain syllables need to be emphasized. The phrases (big and small) must have shape. Colorful seventh chords (with the exception of the Dominant Seventh) can be used to create a sense of “functionality” or “progression,” and also help to “smooth” the voice leading. There ought to be a mixture of major and minor chords (and almost never an open chord or incomplete chord). If written for organ, the difficulty must not be too great (otherwise the organist will hit wrong notes or lift his fingers between chords) even for those with small hands. If written with SATB voices in mind, the range of each voice must not exceed it’s boundaries (how few follow this advice!). There are many other considerations, as well. The point I am trying to make is that a person might analyze an artistic work and say, “Oh, big deal: I see what he did.” However, such analysis is much easier than actual artistic creation! By the way, it really seems to me that artistic works usually follow “principles” (especially principles of balance and proportion). However, the artists themselves might not be able to articulate those principles. Furthermore, I have found that explaining why a piece of music is not good takes a lot of time and effort. Explaining why I as a composer made certain choices also takes a lot of effort. Maybe this is why there is so little information of value published about musical composition. On the other hand, where would I be if my theory and composition teachers did not patiently explain to me the rules of counterpoint and harmony? A true Canon is one of the most difficult things to write. I remember a few years ago, GIA published a collection of 30+ Canons. I said to myself, “Wow, this is so great!” However, it was a lie. The “Canons” were written without any thought to how the pitches line up vertically. In other words, it was like a “John Cage Canon,” or an “Arnold Schoenberg Canon.” What GIA did was so deplorable and such a lie, I don’t even know how to describe it. After all, what makes a Canon difficult to write is how it lines up vertically: they just completely skipped that part . . . unbelievable!